New Storage Giant Promotional Video: Must Watch! 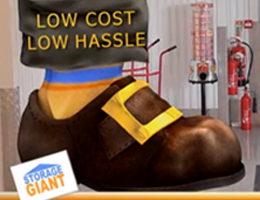 Check out our brand new video promoting ‘The Storage Giant’ and his safe, reliable and affordable self-storage solutions in Cardiff, Newport and Swansea/Bridgend. Let us know what you think! The Storage Giant, now has a voice and a personality. We think he is friendly and if he was present in our stores would make your moving in a breeze. Though could e be more helpful than our staff? We would have liked to have Morgan Freeman do the voice over. But! We got the next best thing. Hope you agree. If you’d like to appear in the next Storage Giant video, please drop us a line. In the meantime, why not take advantage of some of our fantastic storage offers.